It has been a busy summer so far at Ray-Tech Infrared! As contractors are hitting the peak of the 2018 paving season, we are getting more and more calls about getting machines ordered for next year. The need for infrared is definitely increasing and we’ve responded by yet again increasing the size of our work crew. Increasingly popular are our Mini Techs. We’ve talked about the popularity of our 2 to 15 ton truck mounted reclaimers in past posts, but our walk behind Mini Techs have also been flying out the door this year! They come in several chamber sizes and, depending on options, can be powered by a generator or can be self contained with on-board batteries and a charging system. Mini Techs are perfect for sidewalks, driveways, parking lots and numerous other smaller jobs where you may not be able to maneuver a trailer or truck. 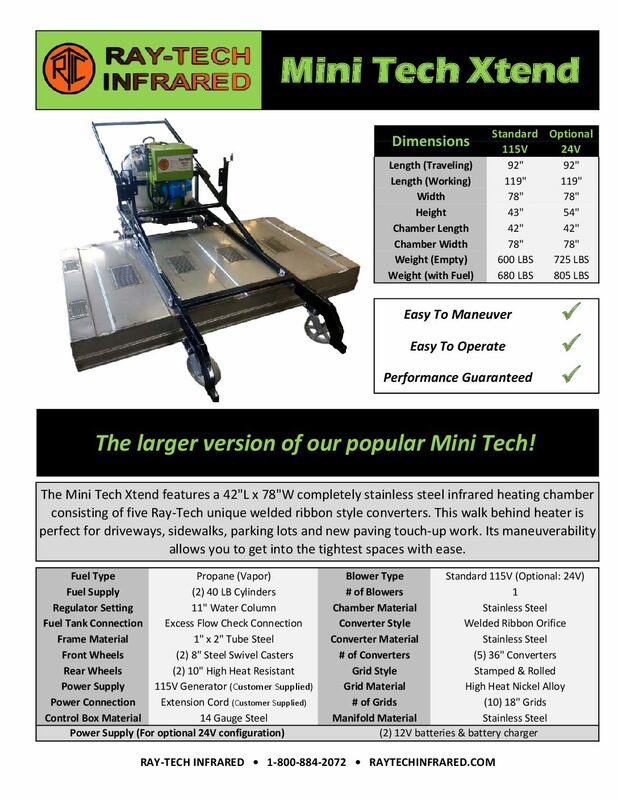 The best part is that our Mini Techs are available QUICKLY! Regardless of the size or configuration, all of our Mini Tech models are available to be shipped one week from ordering. If you have a quick job to be done or are in a tight situation where you need infrared but don’t have one, give us a call and we will make it happen!